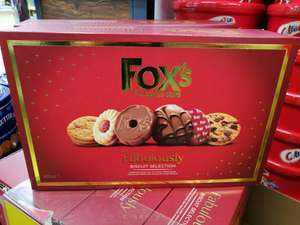 Icelands 7 day deal.....Fox's fabulously biscuits 600g. Down to £2.50 from £4. Deal starts 29/11/17 deal ends 5/12/17. Auch a good price dont be surprised if it sells out by lunchtime on the 29th. People pay £4 at the moment for it. £2.50 is a great buy. Great for xmas presents. so if it was 400gr for £2 with 2 biscuits in each slot, would that be good value ? Deal posting newbie! This is ryan_mcgavin first deal post. Help out by leaving a posting tip or just to show your appreciation for their contribution.